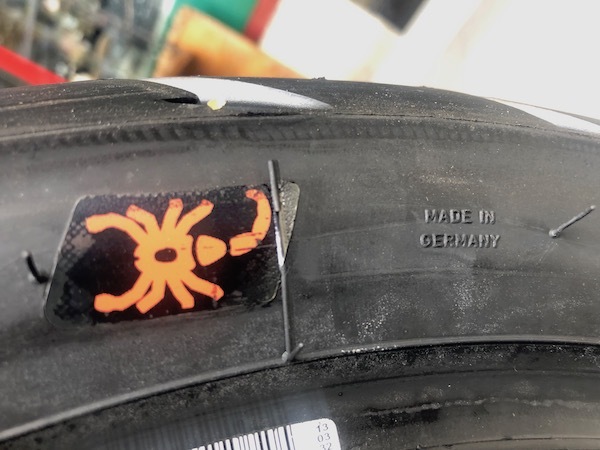 German-made tires for a German-made bike! 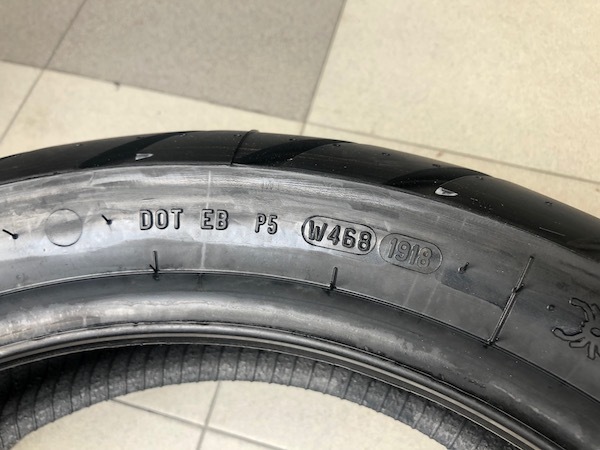 So here are my thoughts on the tires after travelling some 16,000km with it – GRIPPY! Very grippy! Loved the traction on these bad asses. Throw anything at it – asphalt, gravel, sand, grass, soil, and practically everything else – and it feels absolutely planted to the ground! 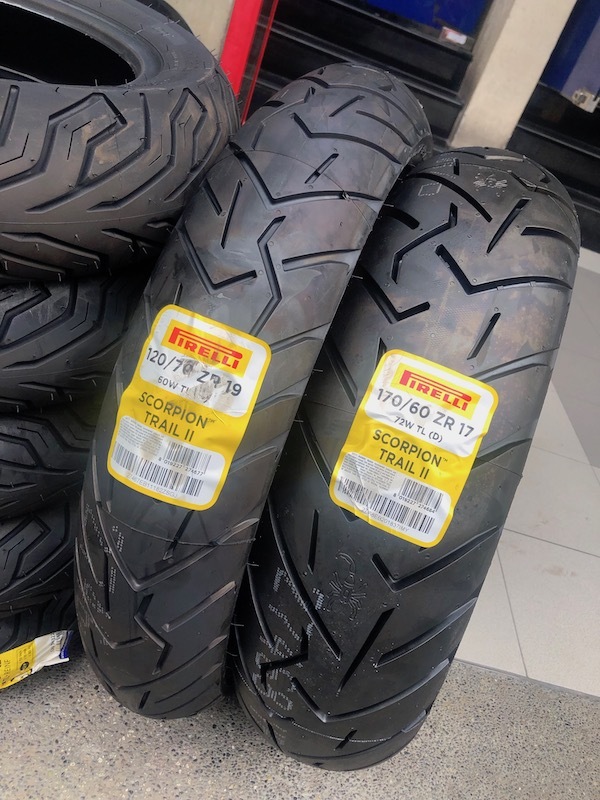 Though these tires were marketed as an on-road / off-road tires, I’d probably classify them as a mainly-on-road / very-light-off-road set of tires – somewhere 90/10, or so. For my kind of riding, this suits me perfectly! I’m not quite an off-road kind of rider, as much as I am a tourer. Both straight line and cornering grip on my earlier set of Scorpion Trails left me wondering how it could have managed that kind of longevity. In fact, I was nowhere near the tire tread-wear indicator when I replaced the old set. 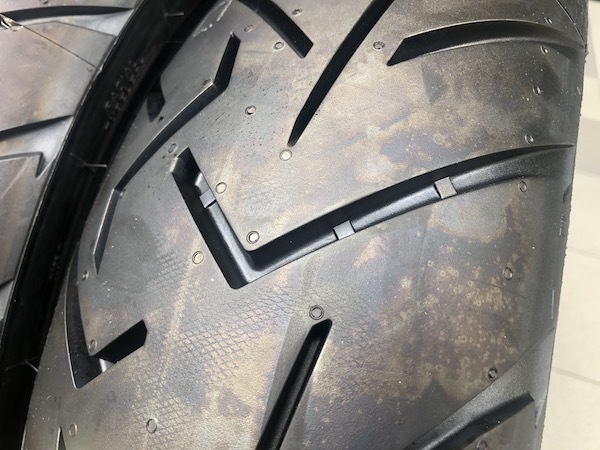 The removed rear tire. Still plenty of life left on the old 16,000 Scorpion Trail II – very impressive longevity!! DEEP treads on the new tire! 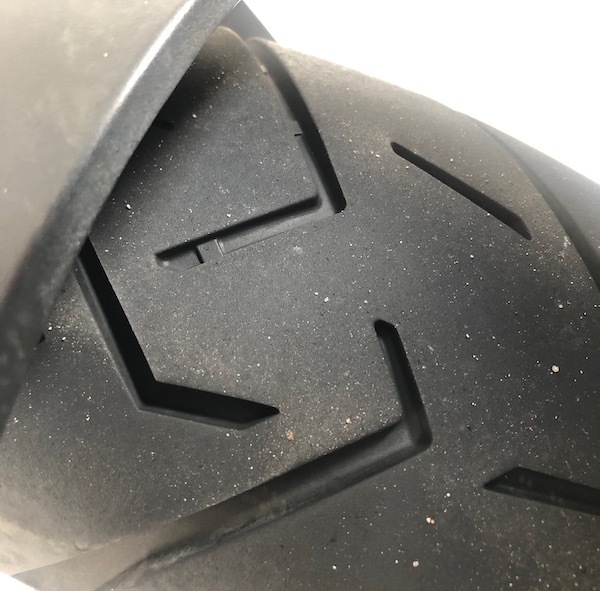 And it was only when comparing the 16,000km Scorpion Trail with the brand new one, that I realised how deep the tread was on a brand new set! This probably explains why it performs remarkably well off-road too! 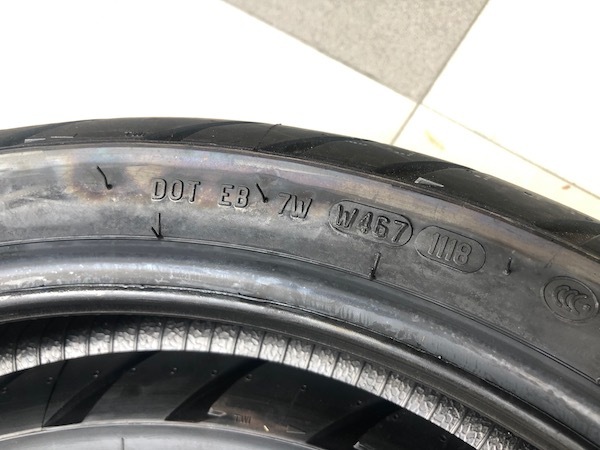 The brand new tires had maximum tread depths of 5.1mm (front) and 9.3mm (rear). For comparison, the used set had about 3mm and 5.1mm remaining depth for front and rear respectively. Pirelli’s little detail to the tire. I’m sure that little scorpion there gave the bike an added 5 hp boost! Front wheel off. Tire replacement in progress. The patched holes – viewed from the inside of the old tire. 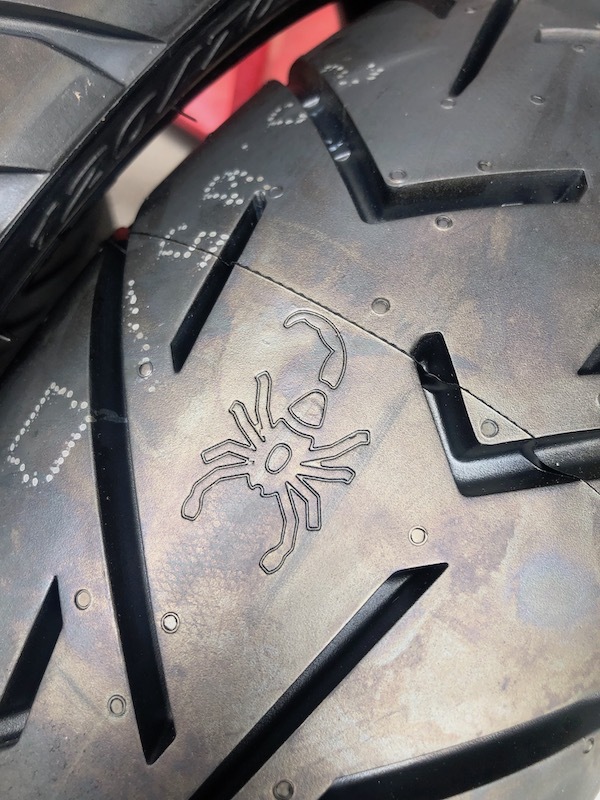 Now that I had the chance to ride a set of worn and fresh Scorpion Trail 2’s side by side, I then realised that the worn set of tires felt very “squared”. The fresh set felt a lot more eager to lean into a turn and definitely made the bike significantly more flickable. And oh boy! With a new set of tires, the bike feels “new” again! 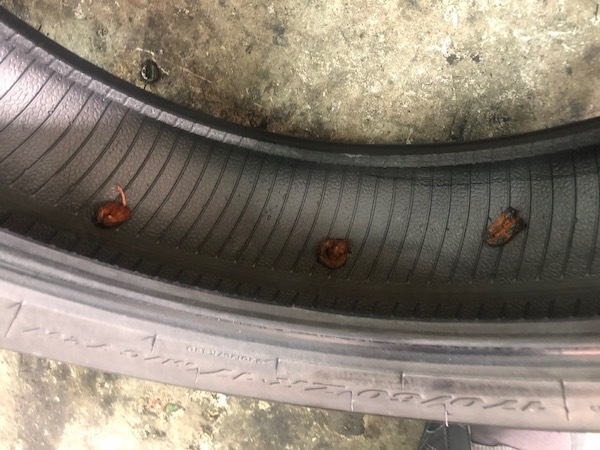 This makes my wonder if I should have replaced the old tires much earlier! Can’t wait to take this along on my next long trip! Where do u get this tyres & wats the price of it? Next Next post: To Melaka, 530km round trip – for Dinner! 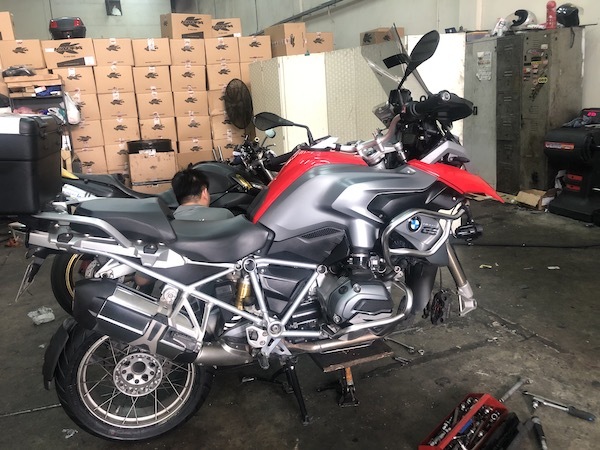 ← Sunday Morning Dirt Trail Ride ← To Melaka, 530km round trip – for Dinner!